Why yes, that is a strange title. But, a coffee toolbox should be a real thing, right? A special box filled with all the tools you might need to make the perfect cup of coffee, anywhere, anytime. Beans and creams, syrups and mixes--all ready for when you need it. This coffee toolbox came from a friend who found a few goodies in one of his rentals. He said, you don't want this, do you? Um, yes! A quick paint job with some off-white paint and then an even quicker stencil was all this toolbox needed to give it a new life. I know I have been stencil happy, but y'all (no I am not southern, but I love a good y'all) these old sign stencils make me happy. And, I am not getting paid to shout them out--I am just having so much fun with them. I have used stencils before, but always individual letter stencils. Having the whole stencil together is super easy, and there are lots of possibilities with these. I used just a part of the coffee stencil on this toolbox. 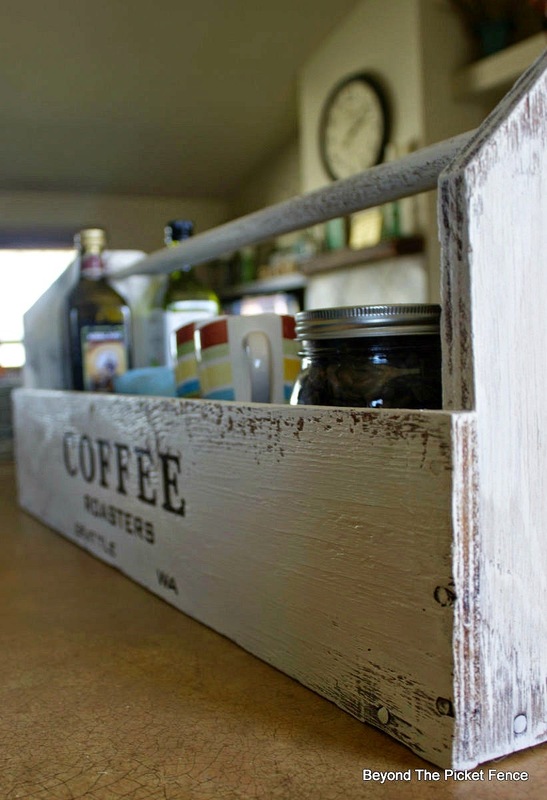 I like the toolbox on the kitchen counter, even though it is big, because it corrals everything into one place--coffee supplies, cups, towels, and other items like oil and vinegar. But, this toolbox would be cute with books, towels, or blankets in it. What would you keep in it? Linking up at Funky Junk Interiors! Thats a great idea. I'd use mason jars for silverware on the counter. I love the tool boxes and coffee too. Just perfect! I love this...you had me at the word "coffee" lol! So many ways you could use this! 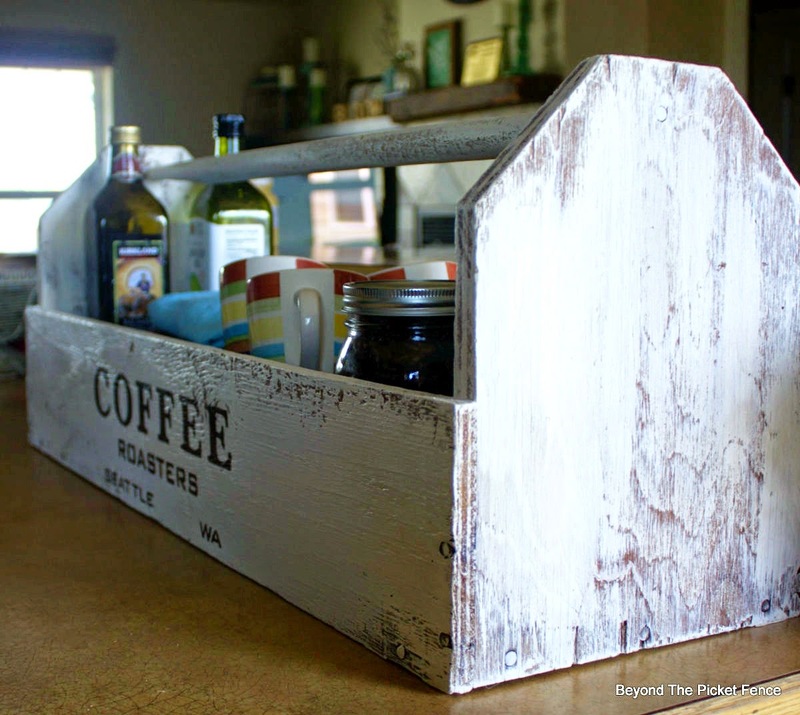 A junky perfect coffee station if I do say so myself! That stencil looks right at home! :) Love it, Becky! It's looks great. I love the stencil. I have a similar one ( picture yours without the handle) sitting on my counter with mugs and coffee in it and I love it. Great job. You stencil like a boss. I never get it so clear. I've been looking for one of those forever ! That is a great idea! It looks so nice in your kitchen! I have a couple of those and I do love coffee! Thank you for sharing this idea! It turned out great, Becky! I love tool boxes, coffee and Donna's stencils :). Nothing like a good old toolbox to gather things together. Great job. And yes, my old sign stencils have been ordered!